80+% of results on the course are a direct result of the quality of your golf swing. So the only sure way to improve your game is to improve your swing. f the change improves your results, try to develop a FEEL for the ‘new’ swing by repeating that motion consistently enough & often enough for your body memorize it. The only language your body understands is FEEL. The challenge is translating swing thoughts or ideas into swing changes that actually improve your results. If you hit a lot of balls and something else doesn’t get out of whack, you can eventually get an updated FEEL. This ‘process’ is inefficient and in most cases ineffective. That’s why the majority of students of even the best instructors still have handicaps over 10. 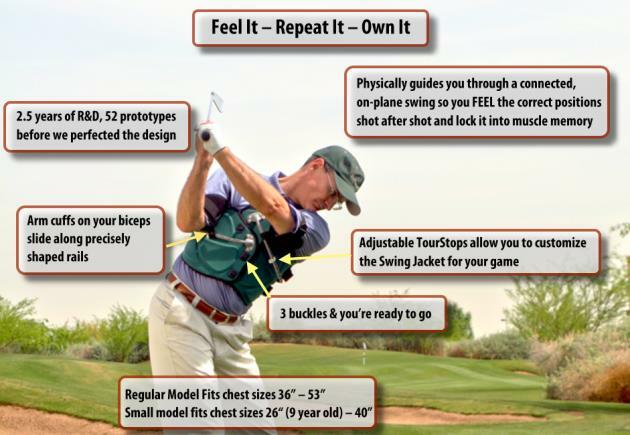 The Swing Jacket physically guides you through each swing so your body FEELS the positions and sequences of a high performance swing, shot after shot. You develop muscle memory quickly and efficiently because you can’t achieve this level of consistency any other way. It took us 2.5 years, 52 prototypes and almost $1 Million to engineer the Swing Jacket to guide you through a swing that mirrors the core swing fundamentals of the best ball strikers. A swing that delivers the long, accurate shots we all love to hit. Own It – This is the way you want to play! Al had struggled with his weak slice for decades. None of the lessons, books, Video’s or training aids he’d purchased had ‘fixed’ the problem. The Swing Jacket taught him to swing on-plane and connected his arm movement to the rotation of his torso. We only let Al hit 10 shots while using the Swing Jacket. You will enjoy similar results when you get your swing connected and on-plane. It’s not magic (although it certainly felt that way to Al) it’s simple bio-mechanics and physics. With the Swing Jacket guiding you through each swing it’s easy to groove a great swing. Well, the Swing Jacket works wonders for real. I was at the golf range and I was slicing the ball all over the place. I asked the guy next to me to hold my mat while I go to my car to get my jacket. I went to the car got my little carrying case and the asked, “Where is your jacket?” I told him it’s in the case! He laughed hysterically. Well, “It’s a swing jacket, I replied.” He went on and on until I had the jacket on and whacked the ball about 170 yards down the middle of the range with my 6 iron. I pulled out my 9 iron and hit the ball 135 yards down the middle of the range. He asked me how in the hell can you hit the ball that straight when you were just up here slicing the ball. It’s the swing jacket I replied. So now I have 3 friends that want a jacket and my Father-in-Law is left handed and he wants a jacket as well. The jacket has taken 8 strokes off my scorecard. I still use it everyday!!! I noticed that with the swing jacket if you are swinging on plane and still hit a bad shot then something else may need some tweaking. Like your grip, tension in your arms, or your alignment. If you fix anyone of those it’s smooth sailing from there. I told everyone I know that plays golf about the swing jacket and they all have seen me use it. It is a product that I would sell personally. I really do love this piece of equipment. It is a product that actually really works like it was advertised to do. Now if you really need some reps to sale this product sign me up. I’m not joking. What’s next? Making real progress means replacing old swing patterns with new, more powerful ones. With every other option available to you that means you have to take all the risk. We’re not like other golf companies, we want you to experience the Swing Jacket difference – risk free.We’ re so confident the Swing Jacket will transform your game in no time. we have no hesitation having you test it RISK FREE for a full 60 days. See how quickly and effortlessly you make dramatic improvements to every aspect of your game − distance, accuracy, consistency with every club in your bag. You’ll feel the difference first time out.And we back up our guarantee with one on one support via Skype, telephone or on-line via our Swing Clinic. With our risk free guarantee you have nothing to lose but strokes off your handicap. Over 100,000 golfers have already gained an unfair advantage, shouldn’t you? The Swing Jacket is a complete training system. You’ll add 30 – 50 yards to your tee shots, a club to a club and a half to every iron, improve your chipping and pitching and learn to hit those challenging half wedge shots like a pro.